As a mom, is it hard for you to find time for you without experiencing mom guilt? Do you settle for eating what you made your kids for lunch? Are you still struggling to lose those last 5 pounds of pregnancy weight? I hear you, mama! That’s why I invited Sara Haley on this episode to help keep it real with you on all things motherhood related. Sara and I are both drawn into this prenatal + postnatal exercise specialist world and work to make a healthy lifestyle sustainable for all moms out there! Though fitness continues to be a big part of Sara’s life, motherhood inspired her to expand beyond fitness and share more of her life journey and struggles. So, take some time for you mama and join in on Sara and I’s chit chat about the juggle that we call motherhood. Sara Haley is an LA-based fitness expert, pre + postnatal exercise specialist and a mom of three. She’s also the creator of the Expecting More DVD, The Fourth Trimester Workout for after baby and beyond, Sweat Unlimited which offers quick workout solutions for busy people, and her newest workout program the Pregnancy Workout Essentials Collection. With almost 20 years of experience in the fitness industry and seven years as a Reebok master trainer, she has recently listed as one of the best fitness Instagram accounts to follow by Women’s Health. Sara always had a passion for dance and after college wanted to pursue a career in dance, choreography and entertainment in New York City. Her time in New York led her to her fitness career as she was teaching classes and ultimately recruited by Reebok to help develop programs for JUKARI. After she had her oldest son, she traded her job traveling the world as a Reebok Master Trainer and working as a celebrity trainer and instructor in New York City for motherhood in Santa Monica, California. Now a mom of three, she shares her challenges, experiences and tools across many social platforms to help other moms discover their own interests and connect with other like-minded women. No matter how many kids you have, an important part of motherhood is taking time for yourself. This is the hardest piece to remember, to implement and to allow. 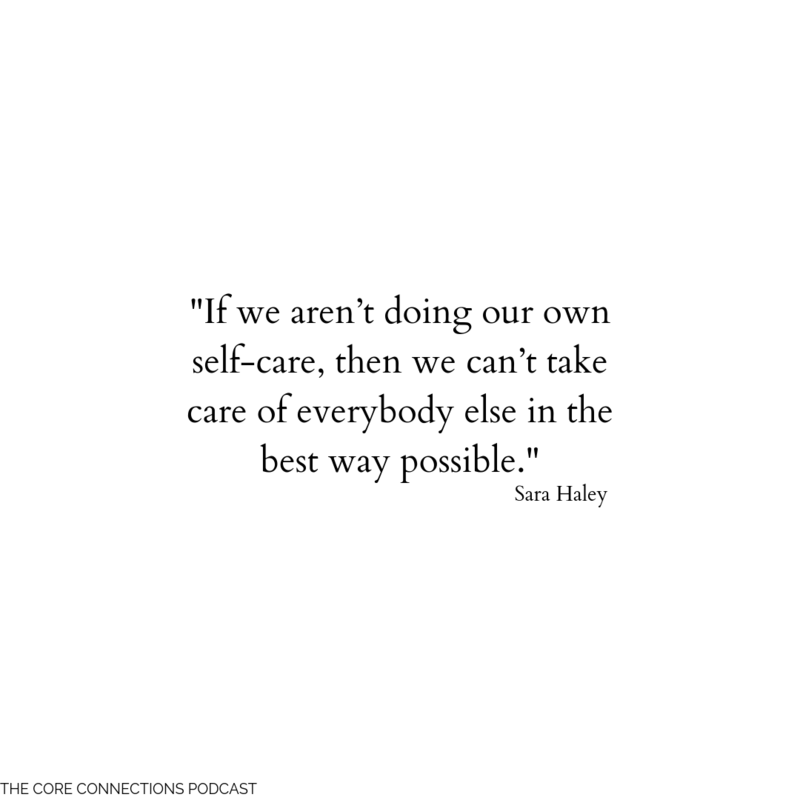 Trying to care for everyone else often feels like the most important, but as moms, we tend to forget that if we aren’t caring for ourselves then we can’t take care of our family in the best way possible. The little self-care actions are important to implement into your routine because otherwise they will keep adding up and add more stress to your body + life. So, schedule that eye doctor appointment or go get that acupuncture because you deserve + need it, mama! As for mommy guilt… it will arise, but Sara reminds you to be okay with the guilt because if you don’t find time to get enough sleep, to get moving or to eat nutritious food then it’s harder for you to do your job as a mother well. If you implement one piece of self-care a day, you will start to feel happy and healthier and at the end of the day, all your kids want is to be around a happy mom. Swap out your breakfast burrito for an egg scramble! Below, I shared with you my nutritious Egg Scramble recipe straight from my Core Nutrition Program to help get your morning started! Don’t eat that quesadilla + fries that you made your kids for lunch. Instead, opt-in for a salad or soup! I love getting in some good greens in my afternoon meal, so here is access to my Mediterranean Quinoa Salad from my Core Nutrition Program! If you find yourself making a lot of pasta dinners, switch out the regular noodles for zucchini noodles. This Greek Spinach + Garbanzo Bean Salad from Core Nutrition is a great way to incorporate spiralized noodles for your family table! Start making conscious choices of cutting out those extra carbohydrates at your meals to start feeling better, and soon enough, those choices will start becoming lifelong healthy habits! As moms, we naturally become creatures of habit. Whether it’s eating the same lunch every day or sticking to the same workout routine. I’m all for creating healthy habits, but it’s important to mix up your activity or nutrition so your body doesn’t get bored and you can keep seeing results. Our bodies need variety!! Sara and I want you to get excited with your workout routine! That’s why Sara and I have both created programs for prenatal and postnatal women so they can move their body in a new way and feel confident about it! So, be sure to check out either mine or Sara’s programs (or do them together!!) to start mixing up how you move your body. Gluten-Free… Fad or Lifestyle Change? The post Pregnancy Essentials Workout Collection: Sara Haley appeared first on Knocked-Up Fitness.